In 1824, Philadelphians were all astir over the visit by the Marquis de Lafayette, one of the last surviving heroes of the Revolution. That same year, in a wave of patriotic fervor, the five public squares in of William Penn’s “Greene Countrie Towne” were renamed in honor of luminaries of Philadelphia’s colonial past. The scruffy southeast park near the Old State House was renamed Washington Square. On October 5th, a group of citizens meeting at the Merchant’s Coffee House resolved to raise a monument to George Washington in the newly re-named park, “in profound veneration of his character and in admiration of his exemplary virtues.” They further resolved that none other than General Lafayette himself would do to lay the cornerstone. Seven months later, fundraising was going very slowly and no design had yet been chosen. Lafayette would visit Chestnut Hill and Germantown in 1825, but skipped over Philadelphia, never to return. After Lafayette’s departure, the city’s patriotic urges cooled and the project languished for years. In 1832, the planning committee was resurrected, including some of the original members – Charles Ingersoll, William Strickland, Nicholas Biddle, and Charles Penrose as well as the Society of the Cincinnati. 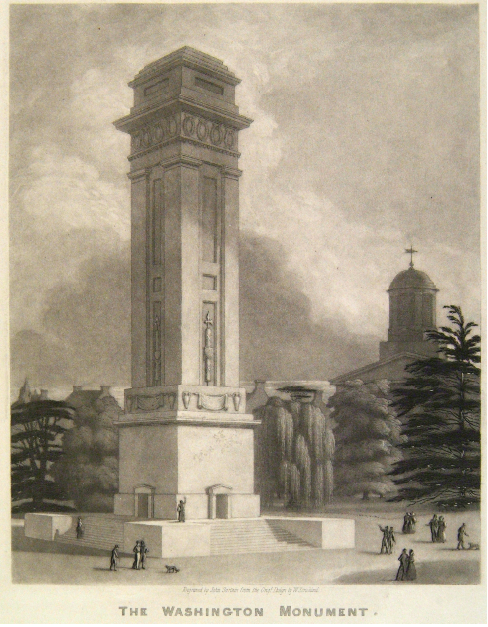 In 1833, architect William Strickland submitted the widely admired design, above, for a grand Washington Monument to grace the center of Washington Square. A ceremonial cornerstone cornerstone was even laid on February 22, 1833. In 1840, with nothing more than that cornerstone having materialized, the concept for the monument morphed into an equestrian statue of Mr. Washington, to be executed by the British-American sculptor Ball Hughes. A model of his proposed design was even displayed in Independence Hall along with several other designs. However, the project dragged on, hampered by the effects of the Panic of 1837 and the collapse of Biddle’s Second Bank of the United States in 1841. In 1842, Hughes moved his family to Boston, where he found work. Eventually, the Washington Square project was eclipsed by the proposal for a national monument in the nation’s capital. The great obelisk in Washington D.C. was begun in 1848 and Philadelphia’s own plan for an imposing Washington Monument was never realized. In 1957, the Washington Square Planning Committee built the present “Tomb of the Unknown Revolutionary War Soldier” in the west end of the park and erected the modest bronze cast of Jean-Antoine Houdon’s life-sized statue of Washington. The Carrara marble original is in the rotunda of the Virginia State Capitol in Richmond; ours is only one of more than twenty other copies that exist around the world, from Oshkosh, Wisconsin to Lima, Peru.